Search for all "AHA1 / AHSA1"
Rabbit anti Bovine, Canine, Equine, Guinea Pig, Human, Mouse, Rabbit, Rat AHA1 / AHSA1. 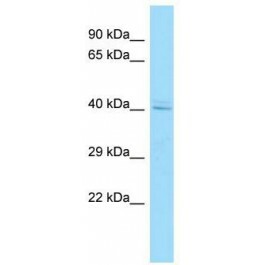 The immunogen for anti-AHSA1 antibody is: synthetic peptide directed towards the C-terminal region of Human AHSA1. Synthetic peptide located within the following region: VMKWRFKSWPEGHFATITLTFIDKNGETELCMEGRGIPAPEEERTRQGWQ. AHSA1 is a cochaperone that stimulates HSP90 ATPase activity. AHSA1 may affect a step in the endoplasmic reticulum to Golgi trafficking.